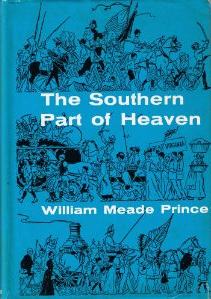 The "Southern Part of Heaven" is a phrase coined by author William Meade Prince in 1950 for the title of his volume of reminiscences of growing up in Chapel Hill. Prince was drawing on an old, probably apocryphal anecdote about a Dr. Kluttz, a Franklin Street store owner in the early years of the twentieth century. As Prince relates it, Kluttz, on his deathbed, inquires of his Presbyterian minister, Parson Moss, what heaven is like, and Moss replies: "Dr. Kluttz, I believe Heaven must be a lot like Chapel Hill in the spring." Prince's title has long held the status of a beloved cliché in Chapel Hill and continues to be cited in both promotional and sarcastic contexts. An example of the latter is a suggestion, not infrequently made, that in light of Chapel Hill's and the greater Research Triangle's development, population growth, and demographic change in recent years, the label should be emended to the "Southern Part of New Jersey." William Meade Prince, The Southern Part of Heaven (1950). James Vickers, Chapel Hill: An Illustrated History (1985). "Southern Part of Heaven." Preservation Society of Chapel Hill. January 19, 2012. http://chapelhillpreservation.com/2012/southern-part-of-heaven/ (accessed September 18, 2012). "Williiam-Meade-Prince-The-Southern-Part-of-Heaven.png." "AOTUS: Collector in Chief: What I'm Reading." The National Archives. http://blogs.archives.gov/aotus/?page_id=314 (accessed September 18, 2012).